Frank Heckler – Comfort Supply Inc.
As a 3rd generation HVAC expert, you could say that Frank Heckler was born into the industry. Frank began working at the Heckler Brothers family business as a middle schooler. He continued to work part-time while pursuing a degree in Mechanical Engineering from the University of Illinois, where he was also a trumpet player in the “Fighting Illini” Marching Band. Upon his graduation in 1958, he went to work fulltime at Heckler Bros., where he remained until 1963 when he moved on to Allegheny Energy. 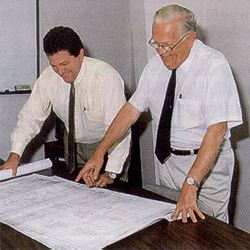 While still working at Allegheny Engineering, Frank started Comfort Supply Inc. in 1986. Eventually in 1988, he put forth all of his efforts into carving a path for the future of CSIpgh. Though Frank ‘retired’ in the year 2000, he continued to be involved in the business until his death in 2013. As an American History buff, Frank particularly enjoyed learning about Pittsburgh History, and he authored “Greentree Borough, Its History and Progress” for the borough’s 75th Anniversary. Frank enjoyed sharing his love of history, HVAC, and life with others. Never one for complacency, one of his favorite quotes was, “Don’t ever let me tell you, ‘we do it that way, because we’ve always done it that way!'”. Frank’s legacy lives on at CSIpgh, and much of the company culture is attributed to the foundation laid by him.